After you have generated your dream form, you can copy and paste the HTML the form generates into any website, or you can install the form with one click on your Blogger Blogspot.com blog. Improve rendering time in Internet Explorer – Firefox, Chrome, and Safari render ok. This will involve slimming down the bulky jQuery code used to generate the form. Have an idea? Have any feedback? Leave it below! it’s seriously very helpful. I will use it on my site as well. Is there anyway to bypass Constant Contacts 2 step signup form. 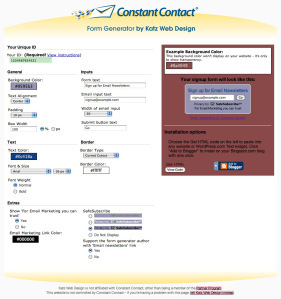 Where customers can enter a name and email on one form and then hit submit? how does this work for Adobe muse? It’s HTML; if you can insert HTML, it will work.